Kacey Musgraves found herself writing music at the early age of eight years old, penning a song titled "Notice Me" for her elementary school culmination. Just a year later she was not only writing songs, but also learning to play several instruments, including the mandolin and harmonica before taking on the guitar at the age of 12. She would later reveal that learning the guitar was "one of the most important things that ever happened to her." Kacey graduated from high school at age 18, the same year she got her start in the music industry. She would record demos to make money, as well as attending local music festivals where she would often sing western swing music. 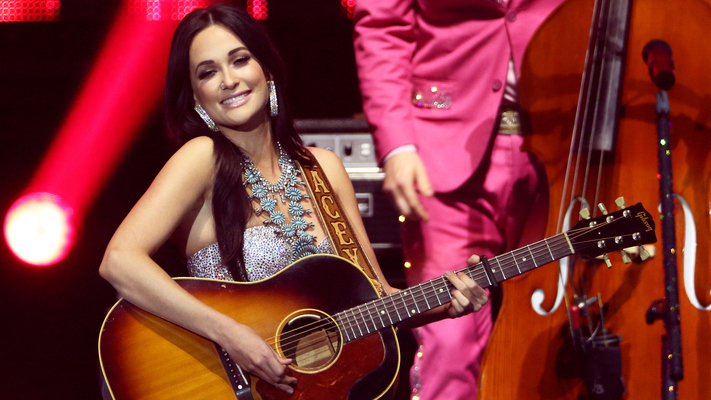 Kacey Musgraves first made waves on the fifth season of the popular talent search show, Nashville Star, in 2007. It wasn't until 2012 that Musgraves received the big break she was looking for. Musgraves signed a major label deal with Mercury Nashville, released her debut single "Merry Go 'Round" and toured with Lady Antebellum on the UK leg of their Own The Night Tour. The momentum continued well into 2013 when she released her major label debut album, Same Trailer, Different Park, and won the title of CMA Awards' New Artist of the Year. Two years after Same Trailer, Different Park, Kacey continued her success with the release of her second studio album, Pageant Material, landing at number one on the Billboard Country chart. In 2016 Kacey released her first Christmas album which included several covers of holiday classics plus original holiday recordings. Kacey's most recent success came with the release of her third studio album Golden Hour in 2018, receiving universal acclaim from fans and critics alike.